Explanation: Where on this moon would you land? The moon pictured above is not Earth's moon but Phobos, the closest moon to the planet Mars. Phobos is so close to Mars that it is expected to break up and crash into the red planet within the next 100 million years. 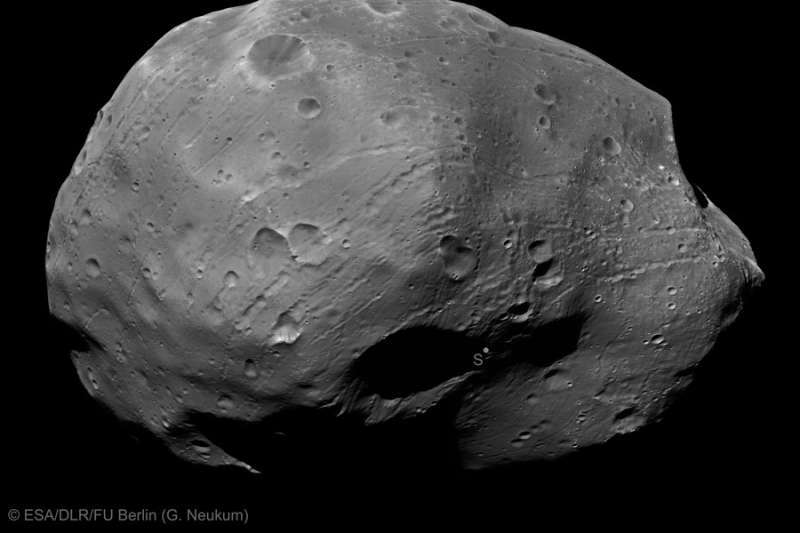 Earlier just this year, however, ESA's Mars Express mission took detailed images of the area surrounding Phobos' South Pole. Visible on the small moon's unusually dark surface are many circular craters, long chains of craters, and strange streaks. Large Stickney Crater, which looms on the far right, was also visible in the corresponding North Polar image taken last year. This and other similar images of Phobos are so detailed, resolving items even 10-meters across, that they are useful for examining proposed landing sites of the future Phobos-Grunt mission. The Russian Phobos-Grunt robotic spacecraft is scheduled to launch toward Phobos later this year and return surface samples in 2014.